Please join us for one of our 2018 OPEN GARDEN dates. We will be open from 10 a.m. to 6 p.m. on the weekends of July 21-22, July 28-29, August 4-5, and August 11-12. 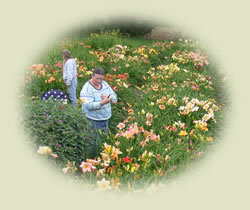 We will have daylilies, a selection of liliums, and some hosta available for purchase. If you would like to visit us, but are not able to make it to one of the open garden dates, we are glad to receive visitors by appointment whenever possible. We do have garden club and tour bus visits by appointment. Give us a call or drop is an email if you would like to visit on another date. This year, we were also open the weekends of May 12-13 & May 19-20 for daffodil viewing. There are no plants or flowers available during Daffodil Days, this is just for viewing pleasure. We do not have bathroom facilities at the garden. 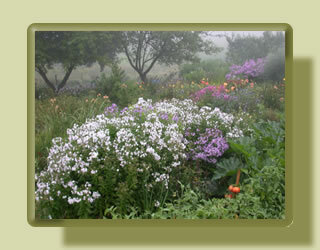 Please plan to make a stop prior to arriving at the garden to attend to your needs. Cumberland Farms in Morrisville village (at the blinking light) has public bathroom facilities. We are pretty easy to find. We are in North Central Vermont, flanked on the west by I-89 and on the east by I-91. Morrisville is at the junction of Rt. 15 East/West and Rt. 100 North/South. See the map for more details. Recently a new bypass was opened which has caused a few updates to our original directions. If coming from Rt. 100 from Stowe/Waterbury, when you come to the stop light just outside of town, turn to follow the “Historic” village signage, as going straight will bypass the village. If coming from rte 15 there is now a roundabout that may make things confusing. Just head towards Morrisville village and then follow the directions below..